Having recently read Lavie Tidhar’s Cloud Permutations and Nalo Hopkinson’s Midnight Robber I was reminded of Patrick Chamoiseau’s Solibo Magnificent, a novel which I’d picked up in a book shop a number of years ago on the basis of staff recommendation. Like this novel and novella, Patrick Chamoiseau makes use of formal written language, combined with a Creole. Solibo Magnificent, originally written in French and the Creole of his native Martinique, uses this to create a rich meta fiction (if you’ve been paying attention, you may have gathered that I’m a bit of a sucker for all things meta). By turns a humorous, violent and farcical murder mystery, Solibo Magnificent is about language, story-telling and how translation can alter language and its meaning. 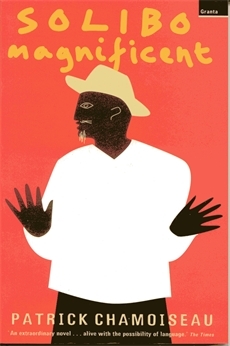 The novel ably demonstrates the barriers that there can be for speakers of Creole, as opposed to the “correct” formal French (incidentally, the translation into English is well handled, preserving the texture of the writing). Chamoiseau’s use of Creole is more than the use of words and phrases to give the novel an exotic air; it’s clear that he speaks, understands and has a mastery of it. Indeed, the helpful afterword sets this novel in the context of the Créolité literary movement he developed in association with Jean Bernabé and Raphaël Confiant. The project was intended as a literary movement to help keep the Creole language alive. The novel opens with the titular Solibo Magnificent expiring with the exclamation “patat’ sa!” (that potato!) on his lips, “his throat snickt by the word” (the bystanders don’t realise that he’s dying and – as it’s carnival time – believe that it’s the invitation to a call and response and repeat his words). His unbelievable death is clearly allegorical for the decline of the Creole, its marginalisation in the face of the arrogant belief that Western literary forms are inherently superior to, in this example, the oral storytelling culture of Martinique. Tangentially, this reminded me a little of Ryszard Kapuściński’s assertion, in The Shadow of the Sun that the written word can be damaging to historical reportage; his belief being that the spoken history is history in its purest form. Of course, in the light of some accusations, which came after his death, this may have a little more to do with Kapuściński’s own attitude to the truth and scholarly historical research. From my own perspective, whilst I do believe that traditional forms of story-telling are valuable and should be celebrated and that myth is equally important (many stories which have their roots pre-mass literacy continue to permeate Western literary culture) I do feel uncomfortable that, where documentary evidence is available, that it should become regarded as somehow impure. History is coloured by the interpretation of the teller, regardless of the form that it takes. However, denigrating evidence as impeding the essential truth of history does seem to me to make it possible to claim anything that you wish; a dangerous thing indeed. Solibo Magnificent isn’t, however, a history and, whilst I’d be concerned about the implications of Kapuściński’s belief for history (though I won’t dwell on them, if only to avoid any logical fallacies) his championing of types of culture which aren’t necessarily held in high esteem is to be welcomed. As the novel follows the police investigation – the French speaking chief inspector, Pilon, cannot believe that the Magnificent could have died naturally; he believes it to have been the result of foul play and begins an investigation into Solibo’s death. In the same way that the manner of his death is analogous with that of the Creole and its rich oral tradition, the refusal of Pilon to accept that there were no suspicious circumstances surrounding the Magnificent’s death, is signalled by his unimaginative and pedantic approach to language. Using language like this is an effective method of describing the differences and the gulf that there is between the people and the authorities in Martinique. Chamoiseau has purpose with the novel; when the locals are asked about what they saw, the stories within stories stack up. The characters become story tellers themselves. Patrick Chamoiseau has a seriousness of purpose in this work. His playfulness (he isn’t above punning) with the language and willingness to embrace the farcical nature of Pilon’s doomed investigation into the Magnificent’s death prevent the novel from being dull. Were he to be more academic in tone, I think the novel would be less successful than it is. He is attempting to demonstrate the value in the Creole oral culture. Using the form of the novel it is important that he not be didactic in tone. The idea is that the spoken storytelling culture is rich and inclusive, preaching to his readers would turn them off; this, in taking a popular form (the detective novel – one that can be trashy) demonstrates the power of literature to educate in a subtle way. Solibo Magnificent successfully and with good-humour demonstrates the value of preserving languages and literary traditions which may become marginalised through a variety of pressures, including societal disapproval. If you’re prepared for the unfamiliar words (both the Martinique Creole and a few of Chamoiseau’s own neologisms, usually invented for comic effect) this is a rich and rewarding novel. Highly recommended. This entry was posted in Review and tagged creole, martinique, meta, novel, Patrick Chamoiseau. Bookmark the permalink.